To the layman UX and SEO (if they even understand what they mean) sound like two entirely unrelated things. The one is about some plumber jabbing away at their phone, while the other is about satisfying the algorithms of a company in Silicon Valley. But we know better. At its core they’re down to the same thing. That’s because the layman doesn’t realize that what Google cares about is ultimately what will satisfy that plumber. And though initially the algorithms they used to get us there weren’t very good at that (and were easily gamed) as time goes on they’re definitely getting better at making sure SEO matches that plumber’s needs. As a result, it is now entirely possible to combine the two to make a better experience where people not only find your site but also can easily do what they came for when they get there. But to do so you need to know what to look out for. That starts with paying attention to what Google now cares about. Google nowadays cares a great deal about mobile friendliness. In fact, if your site is not mobile friendly, it will take a huge hit. That’s down to the fact that most users now no longer surf on their desktop or even their laptops. Instead, the majority of users uses their smartphones. Obviously, when that’s the case, it’s important for Google that the pages are mobile friendly so that even the people reading from the back of the bus can easily surf your site. Of course, that is just as important for you, as when your site is mobile friendly you’ll experience a lot less bouncing. It’s not quite clear to me how Google knows what websites have high-quality content. How do you write an algorithm for that? Whatever the case, they’re getting pretty good at figuring out what pages are full of useful information and what wouldn’t excite a three-year-old. Less is more. Put up less content but spend more time making sure that content is stellar. White space is good space. Short paragraphs with short sentences are a lot easier for people to read. While you’re at it, also use a lot of headings, sub-headings, bullet points and similar reading aids. I guess they say ‘patience is a virtue’ because people don’t have that much. That’s definitely true with loading times. If something doesn’t load very quickly, then people will look elsewhere. That’s why, according to Kissmetrics, a page that loads in four seconds will cost you 25 percent of your visitors. There are a lot of ways to speed up your load time. Throw out what you’re not using, have things above the fold load before the ones lower down and make sure you’ve got an app that caches your content. Little changes like that can dramatically drop your bounce rate. You’ll also want to make sure that people can navigate your site easily and quickly, as that will make your site a lot easier to work with. To help you with that, consider adding the following things. A home page button that’s always in the same place. When people are done with whatever they’re doing on the page they entered, the most likely page they’ll go to is your home page. So, make sure it’s easy to access. Well-formed and clear categories. These have to make sense — not just to you but also to your users. For that reason, you have to user test these! A search bar. If people can’t find what they’re looking for in your menu bar then they will most likely use the search bar. So this is a great back up. Even better, you can look through the searches people do and use that to then update and improve your menu. Not all of us can see the pictures on websites. For that reason, they’ve got alt text. These tell both people who are visually impaired as well as search bots what an image is about. In that way, the user experience for everybody is improved. Well written alt-text allows people to search keywords on images as well as making sure that whoever visits your website will know what everything is about – from the text to the images you’ve used. Really, that’s the key. You want to make sure that whoever uses your site, be it that plumber on his smartphone, your grandmother or somebody who can’t see a thing, they can get what they want from it. The better you are at doing that, the more likely Google will like your site as well. That’s both because they will find it easier to figure out what your site is about as well as they’ll know that they can send people there without having to worry about their experience. And that’s what it’s all about. Giving the people what they’re looking for as easily and effectively as possible. Do that well and you’ll get to eat your cake and have it to. 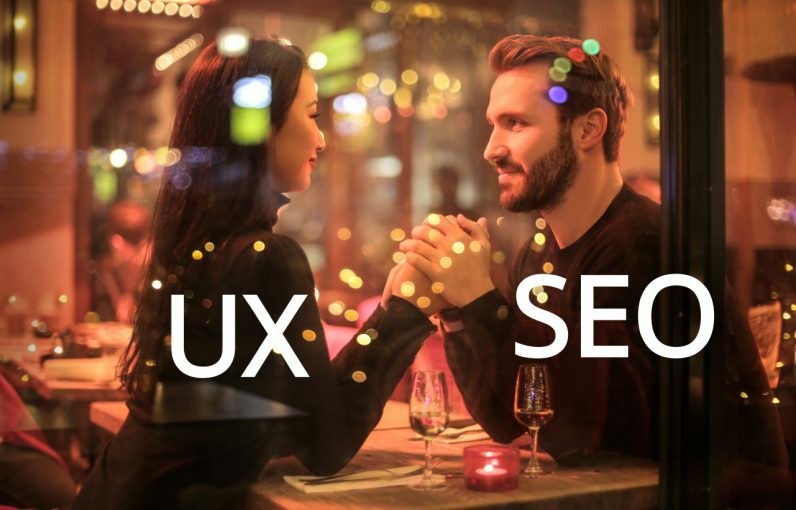 That’s the magic of combining UX and SEO effectively.